Opening an oyster well is an art. As the photo above implies, there are many ways to successfully separate the oyster flesh from the oyster shell. A careful examination of the knives shown would reveal that there are two primary knife characteristics: blade stiffness and blade length. If the knife blade is flexible, it is intended for use entering the oyster between its two shells from the side or front. If the blade is stiff, it is either sharp on the end for defeating the ligament "hinge" connecting the two shells (or valves), or both pointed and sharp on one side for slipping through the "lips" of the two shells. 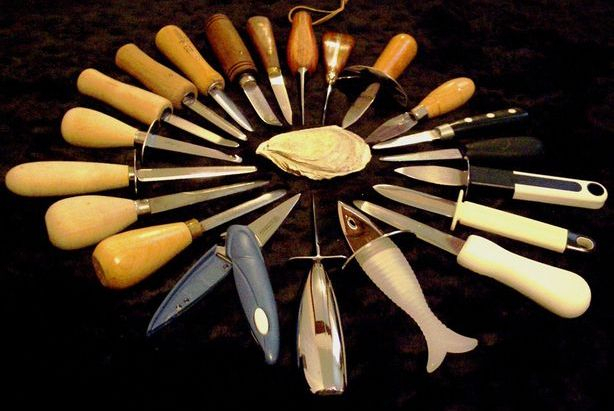 The knife you select to shuck an oyster should match the oyster you want to shuck and the shucking style you want to use. We strongly recommend that you learn to shuck in the presence of and with the guidance of an experienced oyster shucker. Follow his/her advice until you can safely and cleanly open oysters by yourself. No book or website is a substitute for a good tutor. Don't accidentally cut yourself with the oyster knife or with the edges of the shell. Use as little force as possible. Preserve the oyster flesh as intact as possible. Preserve the bottom oyster shell as intact as possible. Retain the oyster liquid (or liquor in French). Remove any unsightly ingredients - i.e. sand, fragments of shell. "Dress" the oyster in its shell for optimal presentation. The edible oyster is unique as a molusc in its asymmetry. The two shells are not the same. One is nearly flat, the other is spoon-shaped. The spoon-shaped shell is the one we want to save to serve as a "cup" for the oyster once it has been successfully opened or "shucked". Since the oyster's job is to filter sea water, it always contains a little liquid. If the oyster is shucked with the spoon-shaped shell on the bottom, I can save the liquid and retain it as part of the taste sensation. When I store an oyster, I always prefer to store it cup side down just in case the oyster opens - I don't want to lose the liquid by accident. The length of the knife blade is determined by the size of the oyster. The ligament connecting the two shells functions like a spring. The oyster closes by pulling its two shells together with its adductor muscles. The muscles work against the ligament. When the oyster dies, it releases its hold on the two shells and opens from the force of the spring action of the ligament. The adductor muscle of a virginica oyster is usually located a little less than halfway from the ligament to the outer lip of its shell and to the left of center. So with the oyster "cup side down" and with the ligament held away from me, my knife blade must enter between the two shells and slide in against the top shell or "lid" and sever the top of the adductor muscle. The oyster knife blade must be long enough and sharp enough to neatly do so. The longer the distance from the entry point of the knife to the adductor muscle, the longer the blade. A very long blade is only useful with a large oyster. Once the muscle holding the top shell shut has been severed, the top or flatter of the two shells can be removed. If I entered the oyster by prying the ligament apart, the shell is already loose and free to remove. If I have entered the oyster from the side or front, I must still separate the two shells by prying them open by hand and defeating the ligament. In order to use the spoon shaped shell as a serving dish, I still need to cut the side of the adductor muscle that is hidden below the fleshy body of the oyster. Since the visible top of the oyster flesh is often accidentally lacerated during the initial opening of the oyster, the shucker sometimes flips the oyster flesh over exposing the cleaner cut on the bottom side for serving. Oysters come in a variety of shapes and sizes. Sometimes they are undulating in shape and conform to the environment where they live in odd three dimensional ways. Other oysters are more or less "regular" in shape but are oversized. The bigger the oyster, the more effort it could take to pry it open. If I intend to open an oyster from the front or side, my blade must successfully traverse around the edges of the oyster shell, regardless of its geometry. If I enter the shell by defeating the ligament, the size and shape of the oyster is of minimal consequence. So, I call shucking an oyster by way of its ligament, the UNIVERSAL METHOD. With the universal method, the hand that holds the oyster in place is not in line with the point of the knife. What is more important is that once the tip of the (stiff) knife blade is lodged well into the ligament, the shells are separated by using a twisting motion with minimal force. All that remains is to hold the oyster safely in one hand, while operating the knife with the other. I always hold the oyster in place with a hand towel. I wrap the oyster in the towel so that only the oyster's ligament is visible. I stand at the kitchen counter with the towel and oyster firmly clamped against the countertop or a cutting board with one hand. I insert the blade into the ligament and twist/pry until I feel the "pop" as the two shells separate. Then I slide the blade into the oyster staying on the top side of the oyster between its flesh and its top shell. I rotate the knife horizontally until it scrapes the shell clean from its adductor muscle. I remove the top shell, slide the knife blade under the flesh, and sever the bottom of the muscle from its spoon-shaped shell. Then I remove the stray particles from the shell, adjust the flesh and ready it for its slippery slide onto my tongue. 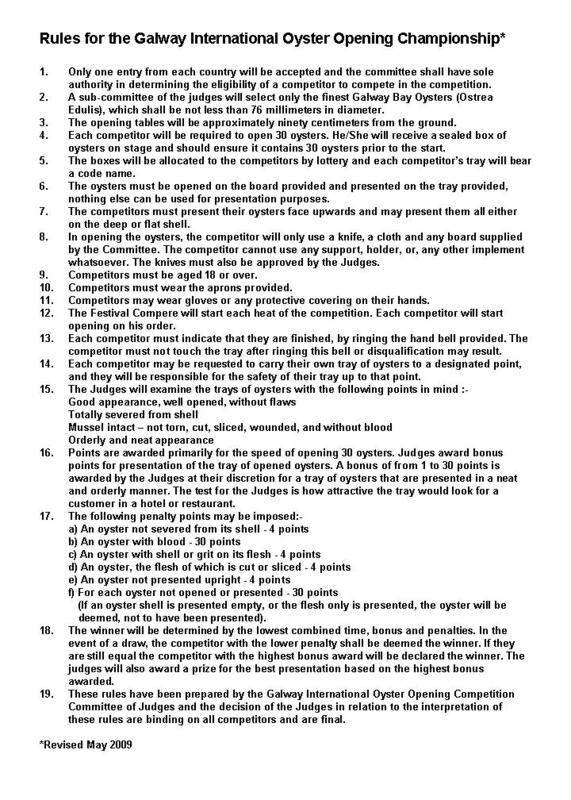 Here are the rules posted for shucking oysters at the international championship shucking contest in Galway, Ireland.